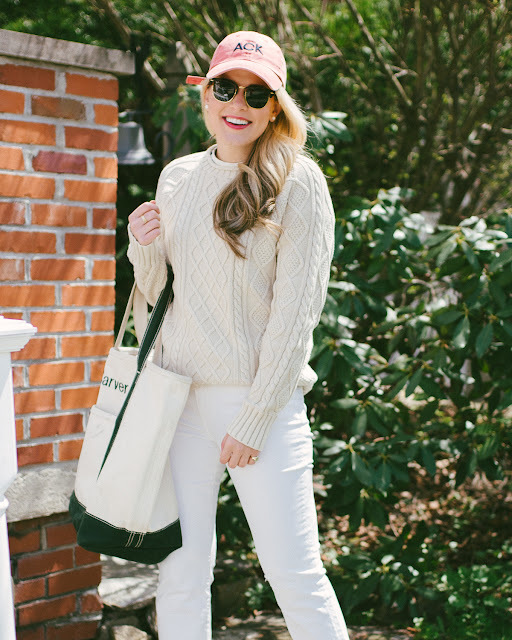 Men's Fisherman Sweater// I talked about this sweater, here, and it truly is such a great find! 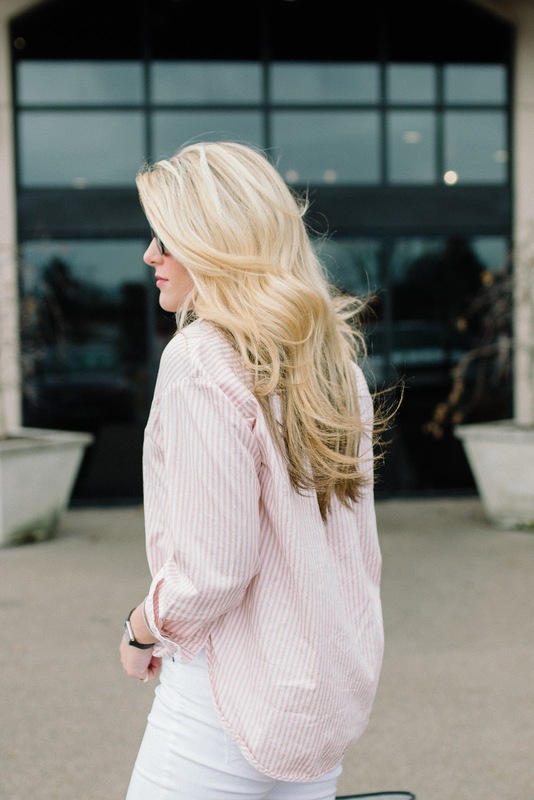 Long Sleeve Cotton Tee// I loved this basic find so much that I went back and ordered more colors. Great as a pajama top or a casual lounge top, these are awesome. Size up once since they are 100% cotton and will shrink a bit in the dryer. Fig and Grapefruit Candle// This candle is incredible. It smells fresh but cozy and it really fills a room wonderfully! It would be great for a kitchen if you want to neutralize bad kitchen odors. Wellaplex// I talked about my WELLAPLEX treatment, here. It has been a few weeks and I am obsessed. I could not recommend the treatment more! My hair looks and feels so much softer and healthier. Sweater Shaver// I wrote about this little gadget, here. It is worth every penny and has saved some of my pilling sweaters from being thrown out! Lake Pajamas// These are truly the BEST ever. I can't get enough. They're definitely pricey, but they're worth every penny in my book. The cotton is so soft- unlike anything I've ever felt. Lip Balm// This balm is just $6 and I love the rose! I think it's a great calming scented balm to put on before bed! 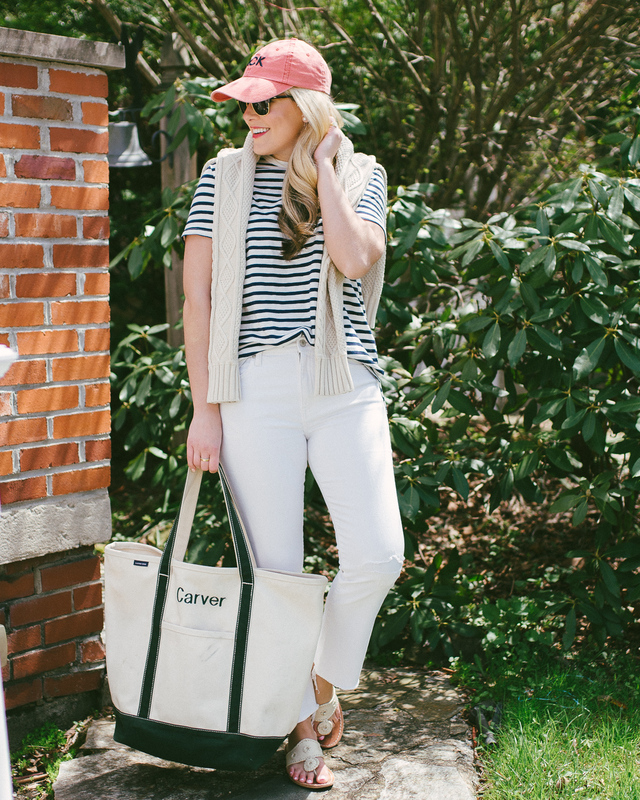 Nantucket Tote// This tote is SO good. It has so many pockets and is big enough to carry pretty much anything I could ever need. This Barrington Gifts tote continues to be a favorite of mine. I also just got a new passport (read about that, here) and got one of their passport holders. It is SO cute! I also love this, this (want! ), this, and this! Poulet Bleu// I tried this new restaurant for my birthday dinner and it did not disappoint. It's located in Lawrenceville and specializes in French fare! You can see more photos, here. Eddie V's Bar// I tried this bar and loved it. They make a wonderful French 75 and the atmosphere is upscale and chic. Plus they have live music in the lounge area! Chik Fil A Diet Lemonade// I've always loved a CFA DL, but I've been obsessed lately. So fresh and great for summertime. GG Crackers// You can read more about these 'appetite control' crackers here! But basically, they really do work. (hint: don't make the GG pizza recipe- it's gross!). Lost in Space// I just finished this Netflix series of 10 episodes. It's a little cheesy and definitely nerdy, but something interesting and cute/lighthearted! Happy Saturday, everyone! I *think* we are in the clear from the snow and super freezing temperatures. I hesitated to type that because I don't want to jinx anything! But this weekend it's milder temperatures which I am always happy about. Plus, we are celebrating my cousin's graduation from the University of Pittsburgh! Other than that, I plan on getting my apartment in good shape and paying lots of attention to Henry. I've been busy this week and I always feel bad when I can't give Henry a lot of attention!! He has been such a good boy lately, I am obsessed. Scroll through the widget at the top of this post to see my favorites from this week! I am all over the place with what I am loving, but there are so many great pieces out right now. I think it is hard to stay away from trends. I just naturally prefer classic pieces and in my perfect world, there would never be a trend. But trends can also make things fun. I get it. However, in today's retail world, it's like every single brand shoves a trend down your throat until it's almost unavoidable. Does anyone else feel like that? 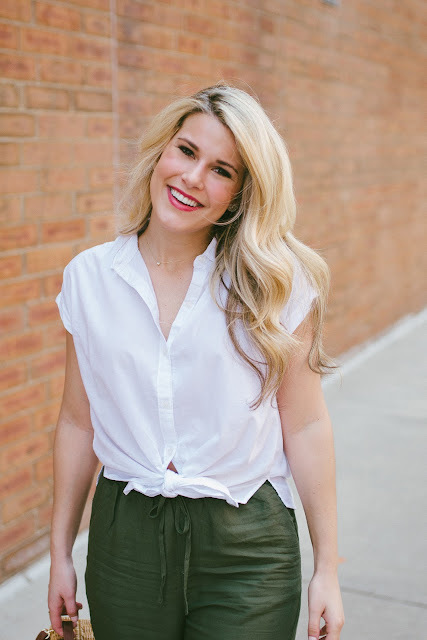 Take, for example, the cold shoulder shirt. It has been EVERYWHERE for years now. You will never find me wearing a cold shoulder top. I guess one should never say never, but it's true, you just likely won't see me in one. I think I need to mention that I am not judging anyone wearing a top like that- I say you do you. Fashion and style are ways to express ourselves and if we all had the same tastes in clothing, life would be pretty boring. I also think some can pull off a cold shoulder top better than others... I am one of those 'others'. Since there are so many trends flooding all the retailers (even the classic brands) it's refreshing when you're able to find a genuine classic- a true quality piece of clothing that you know you'll have and wear for years to come. I happened to find a true classic in the men's section: this fisherman sweater! This isn't really a new one for me because I've always browsed in the men's section. Every once in a while, you can find really cute pieces for your own wardrobe. I typically get a size small or x-small and it either fits just right or it's comfortably oversized (like a boyfriend fit). There are so many endless ways to wear this sweater and you can really wear it all year round. Even better? Since it's just cotton, you can machine wash it (but I don't put it in the dryer)! 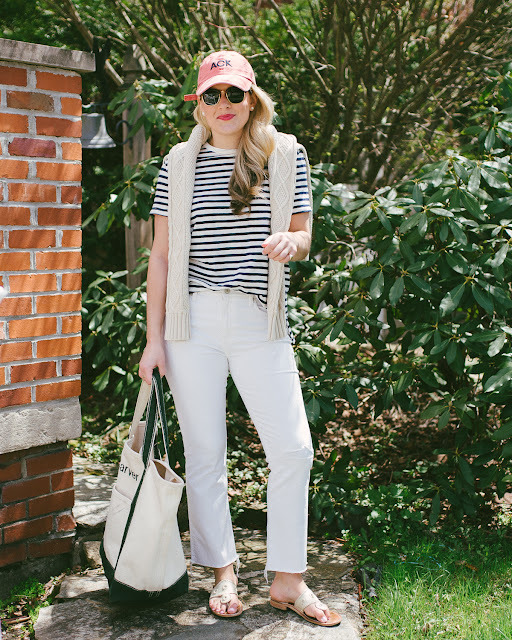 Here we are- the last Lately post of April! This month was great. It was my birthday month, after all! I made sure to clear April of travel. I wanted just one month that I could make sure to spend at home. It was great because I was able to relax more on the weekends in my apartment, get together with friends and family, and catch up on Pittsburgh life in general! This week was one where I got a lot done! I feel like I have been very productive overall this month. I typically clean my apartment before the weekend, but this week, I cleaned on Sunday. It was really nice to start the week with a very clean space. It was refreshing and set me up for success this week! This weekend, my cousin, Paige, is graduation from college! I actually can't believe it because she still seems so little to me! I'm excited to celebrate with her on Sunday. Pittsburgh-ing: The photos at the top of this post are from my birthday dinner at a new Pittsburgh restaurant, Poulet Bleu. It's a French restaurant located in Lawrenceville by the restauranteur, Richard DeShantz. I had been wanting to go since it opened but it was hard to get a reservation on a Saturday night! My thoughts? It's a must-go. The decor is something straight out of a Nancy Meyers movie and it feels like you are on vacation rather in Pittsburgh. It's truly something different and something Pittsburgh did not have. Everything was wonderful and I really liked that the wine list was very affordable. The only thing that was annoying is that they make you pay for bread and butter. It's only like $4, but still. It's a pricey French restaurant and you'd think they would bring baguette before your meal as a courtesy. They're just overall chincy with their bread. We had ordered mussels and it came with two measly slices to sop up the delicious broth. Definitely not enough for 4 people when there were enough mussels for probably 6 people. It's a small but very valid constructive bit of criticism. 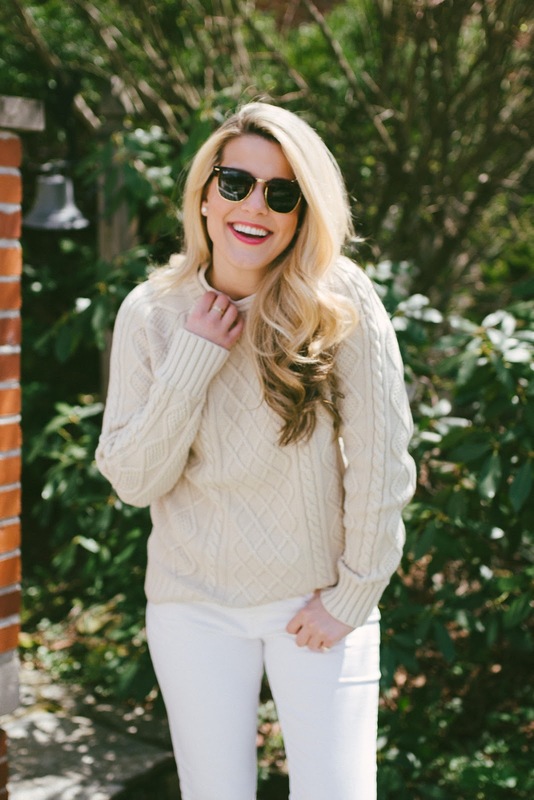 Wearing: I got this men's sweater recently and love it. I'm wearing a size small and it first perfectly! 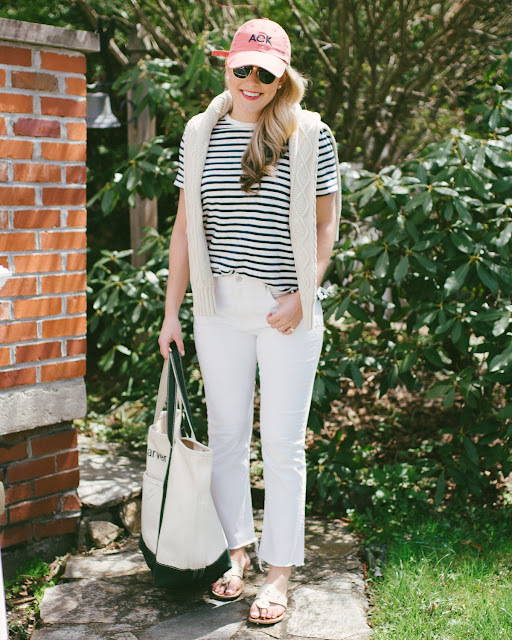 I love that this is cotton for spring/summer/fall and can be machine washed. Eating: This week, I wrote a post about GG crackers that you can read, here. Sale-ing: Talbots just kicked off their Friends and Family sale where you can take 30% off your total purchase. You can find some really good deals in this sale- especially because Talbots always has nice quality. I just got this gorgeous white dress and my mom got this top and skirt. I tried these cropped sweats on in the store and they surprised me so much. They're beyond soft and comfortable but also really flattering. You could wear them to run errands and look cute/put together! Watching: My friend Aly and I went to see Chappaquiddick this past weekend. I rarely see a movie in theaters anymore, but this one is worth going to see! It is so well done and interesting. It's about Ted Kennedy and the death of a woman while they are driving on Martha's Vineyard and how he tried to cover it up. Loving: This Lilly shift has to be the best ever! Is anyone else as obsessed as I am? Wanting: So many cute things right now- I'm soooo ready for it to warm up here in Pittsburgh. It's definitely been milder, but we are still getting into the 30s at night and in the early mornings. I am ready for that to go away!!! Smelling: I got this fig candle at Target the other day for under $10 and it smells so similar to the Diptyque Figuier, which is one of my favorite scents. I personally prefer a clear glass candle because I like the glow that it gives off, but the larger version of the candle comes in this beautiful ceramic blue and white holder! Quoting: 'When we strive to become better than we are, everything around us becomes better, too.' - Paulo Coelho // See more of my favorites, here. I was at Target last night and I had another post scheduled for today, but then I thought this would be a good topic, so I'm switching things around to fit this post in! I typically try to avoid Target at all costs. The more I stay out of Target, the more stays in my wallet, ha! But in all seriousness, I really do stay out of Target for as long as I possibly can. I ended up running out of razors, so I finally ended up needing to go. I'm pretty brand loyal when it comes to certain things, but then don't care at all about others. At Target, they have their in-house brand, Up and Up, which is typically cheaper than brand name products. I have a few tried and true favorites that I thought I would share. But as a disclaimer, you always want to check the prices on the brand names vs. Up and Up because Up and Up isn't always the lowest price. For example, this Scotch packing tape is something I buy often and it's the same price as the Up and Up so I always choose the brand name. I always like saving money, but I sometimes find you end up wasting your money on the generic if you don't know what to look for (for example, I have tried generic glass cleaner before and I just don't think it works as well as brand name)! I think these are the best! They are so similar to Venus and while they're not exactly the same, they do the trick and are substantially cheaper. They have 5 blades and have a surrounding strip that helps the razor to glide smoothly. I take a probiotic daily and they are expensive! I have tried other name brands that I like a little better than these, but I do like that they are higher strength and that they are in capsule form. The price is dramatically lower than most other probiotics out there and I think they are 'good enough'. You can literally buy a bottle of 1000 ibuprofen for less than a bottle of 300 Advil (both the same strength at 200mg). I actually have no idea why you would buy the Advil brand because these are exactly the same product just without a brand name. They make capsules, too, if you prefer those, although they cost a bit more. I have tried more 'luxurious' shave gels, but this one does the trick day in and day out. Sometimes I'll 'splurge' on a brand name shave gel but I honestly don't think there's enough difference to warrant spending any more money! I think this one smells weird/unappealing, but the rest smell great! I have tried other generic dishwasher packs before and I haven't found them to be as good as brand names. These ones, though, really do work well and don't make my glasses foggy at all. Everything comes out clean and sparkling just as they do when I use a brand name! I have a Swiffer brand broom/mop (not really sure what you call it) but I get the generic wipes. They are a lot less and work just as well as the Swiffer brand! I love that this bottle has a pump and it works just as well as any brand name polish remover! They also have these gel nail polish remover foils and they're so convenient! Do you have any favorite Up and Up products or generic products I should know about?! Let me know in the comments! Today we are discussing the very trendy 'GG Crackers'. It's a Scandinavian bran cracker and has become popular after Tanya Zuckerbot discussed them as a part of her F-Factor diet. The crackers have been around since the early/mid-1900s and are known to be packed with fiber. Just one GG (original) cracker has 12 calories. A serving has 20 calories, 4g of fiber, and 2g net carbs. I haven't read the book (but I am drinking the Kool-Aid and ordered one to read), but the very basic science behind consuming a lot of fiber is that fiber makes you fuller (for longer) and in turn, you eat less of everything else. I'm not totally into diets. I get exercise and eat pretty healthily generally. However, I have weeks... heck, months where I am 'bad'. That's when I try to get back on track. The GG crackers tout themselves as an 'appetite control cracker'. Another benefit is that since they are high in fiber, they help with digestion, too. I am hoping that means they will also help to kill bloat. So I figured I would get them and try them out. Before I was able to get my hands on the GG crackers (they are hard to find in stores- I suggest finding them on Amazon or GG's website). I stumbled upon Trader Joe's version. Trader Joe's version is only really similar in that it has 4 grams of protein and 3 grams of fiber per cracker. Otherwise, these crackers are night and day. The Trader Joe's version is like a more filling, healthier cracker. It's actually flavorful and delicious on its own. Plus, it's substantially larger than the GG cracker. It has a lot of seeds in it so that's where you get the added fat and protein that the GG cracker lacks. The GG cracker has very few ingredients and has a rough texture- almost like a Triscuit. Honestly, the GG crackers alone taste pretty bad. I don't think I'd ever eat one on its own. Not because of the taste, but because they are so dry. However, I ate two slices of the GG crackers topped with tuna salad (it was delicious) and I was SO full. How often can you say that you ate tuna salad and are stuffed?! You're actually supposed to eat 4 crackers (or so Tanya says) to feel full for a long period of time, so I plan on doing that from now on! Tanya is such a believer in these crackers that she is selling a cracker pouch. I could not make this up if I tried. So, if you are comparing the crackers, I'd say you should get the GG crackers for the F-Factor diet and the appetite control. The Trader Joe's version is just a yummy cracker (with some healthy ingredients). On GG's website, they have some recipes you can try with your crackers. I like the idea of a GG pizza. I think you could do PB and J, scrambled eggs, salmon and cream cheese, chicken salad... really the options are endless! The F-Factor has a huge archive of recipes, but I really only plan on adding the GG crackers into my diet and not really following the entire diet because the addition of the crackers is so easy! Have you heard of the GG crackers? Have you made anything good with them? I'd love to know! 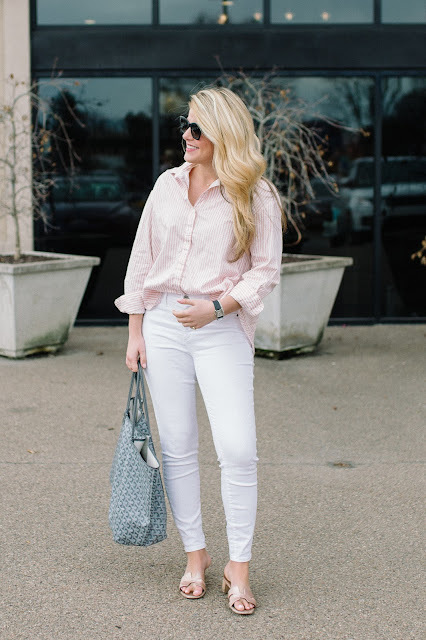 Today I am sharing some really cute shoes for spring and the best part is that they are all under $50! I know everyone works with different budgets and I'm often asked to share some lower-priced options. I was surprised to find a lot of cute shoes under $50! My opinion when it comes to accessories (like shoes and bags) is quality over quantity. Buy the best you can afford. I'm not a fan of fake leather and can appreciate a well-made shoe. 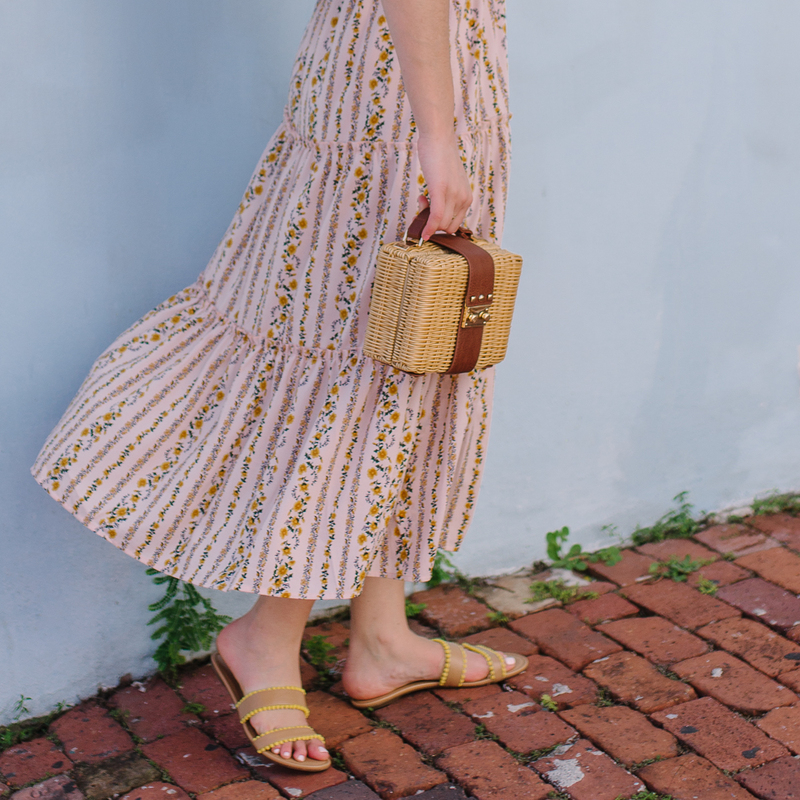 But, I think you can find a lot of lesser-priced, but well-made shoes for spring/summer because the materials (like espadrilles) are just a lot cheaper. Not to mention, there are always some really great sales going on. For example, Talbots has a great sale on their shoes from time to time and these flat sandals are one of my go-to comfy sandals in my closet. Right now they're only $30! Three of my favorite resources for affordable shoes are Old Navy, Nordstrom Rack (really good for men's shoes, too), and DSW. I bought a pair of sneakers from Old Navy for my trip to Paris this past fall and they were one of my most worn pairs of shoes because they were cute and comfortable. They have cute neutral, classic sneakers like these white ones for under $20! Scroll through the widget above to see some of my picks! All of these are under $50! There are a few places that are very dangerous for me that I try to avoid at all costs: Target, Homegoods, and Sephora. They're places that you walk into for one thing, but you end up coming out $100+ later. Every. Single. Time. Is it just me? I hope not. Anyway, Sephora is having a big sale for VIB members. You get 15% off the Spring Bonus products and Beauty Insider Members get 10% off. It runs through the 23rd. I'm personally a VIB member. Here's my tip! My mom, sister, and I all share the Sephora card (it's just a points card!) so even if we don't spend too much ourselves, all three of us together are sure to still secure our status each year. I know 15% off may not sound like much, but it's awesome because a lot of these products never go on sale. I thought I'd share the items I'm ordering from the sale as well as some of my favorites that I would recommend getting! You can read the most recent post on my makeup routine, here. Lip Glow// You guys know how obsessed I am with this lip balm. I have so many and have one on me at all times. My two favorites are the pink and the berry. They are moisturizing and just give your lips enough color to look naturally flush and healthy. They have come out with a matte berry shade and I am intrigued. I like the somewhat creamy texture of the satin finish balms but the matte could be good in the right settings. It's expensive for lip balm, but it's definitely one I'm willing to spend on because I love it that much. Mediterranean Honeysuckle// This is one of my favorite summer scents. It's light and fresh and just makes me very happy. Not to mention, the bottle is gorgeous and I swear I am complimented every time I wear it. I'm interested in the newest scent because it has hints of sandalwood which is one of my favorites. Bum Bum Cream// I just love Sol De Janiero in general. Their products make me think of summer and have a warm tropical scent to them. The bum bum cream is aptly named because it's meant for your behind. It has guarana in it (caffeine) so it's supposed to help improve skin elasticity. I'm not sure if I'm just drinking the Kool-Aid, but I love the way my skin looks after using it. I use it on my legs, too! I feel like it just makes my skin look so much healthier. It's expensive and I would not normally spend this much on a cream- but I really love it enough to pay the price. The only thing is that I wish it came in a pump bottle rather than a tub. I just like that type of dispensing format better in general. SPF 30 Tinted Moisturizer// I don't typically wear a lot of makeup when I'm out in the sun by the beach/lake/pool. 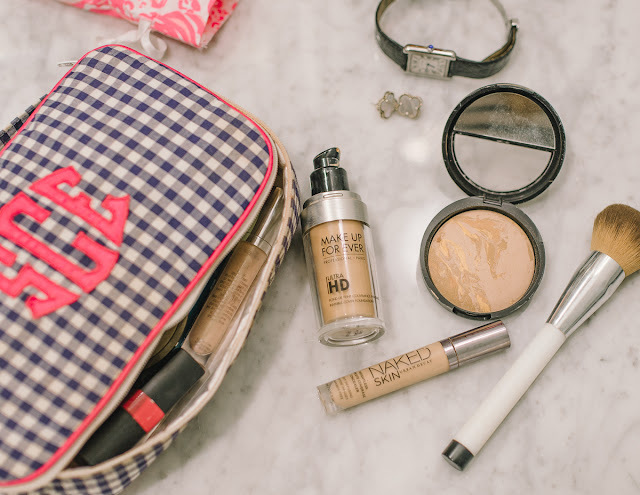 I am usually only wearing this super flattering tinted moisturizer and lip balm! It's hydrating and has anti-aging properties which is what sold me over any other SPF moisturizer. It's also really creamy and easy to apply with a good amount of coverage that just evens out my skin and gives me a healthy glow. T3 Hairdryer// this is the hairdryer I use every single time I wash my hair. It is super lightweight and gets the job done very quickly. 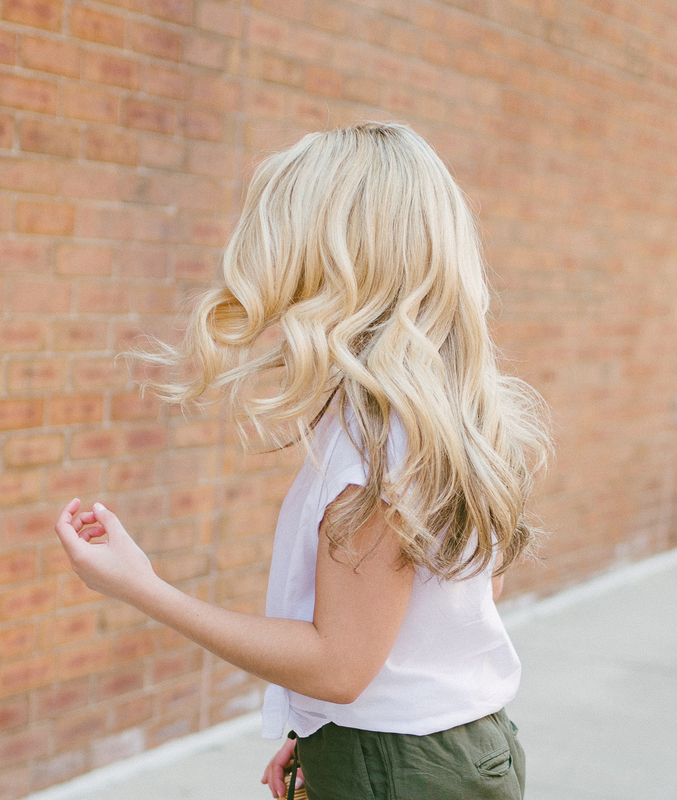 It is supposed to be less damaging to your hair and I really do believe that! Crushed Lip Color// This is a matte lip color that is pretty pigmented but very easy to apply without a mirror. It doesn't feel dry but rather hydrating, yet it still stays very matte in appearance. I love the shade 'Babe' and wear it weekly. It's a great daytime and nighttime color! No More Baggage// This eye cream goes on and visibly reduces puffiness. I LOVE this stuff. It totally works. I pat it under my eyes in the morning before I apply my makeup. It feels cool and refreshing and I always notice brighter looking eyes! The Ordinary Products// I just bought a few a few weeks ago. They're SO inexpensive and I've been loving everything I have tried so far. I recommend the buffet, 30% vitamin C, salicylic acid, and glycolic acid toner. Eyebrow Powder// This is the holy-grail of eyebrow powder! I am obsessed. I use the light half for my eyebrows and then the darker color for liner! I'm not a makeup artist and powder always seemed intimidating to me but this is sooooo easy to apply and gives you a very natural look. Cleansing Cloths// These are SO good. They're one of my all-time favorite products. I don't use them for removing makeup but just for refreshing my face. I typically use one in the morning or at night and then always immediately after a flight. They have this little pack that is perfect for traveling. Exfolikate// This is a grainy exfoliator and the sample size is even pretty $$$ but I tried my friend's and promptly ordered my own. It's SO good at exfoliating and instantly makes your face feel refreshed and cleared of any gross dead skin patches. Naked Skin Concealer// I use this as my #1 go-to concealer for under my eyes and concealing blemishes. It's very opaque and can be layered without being cakey. It's fool-proof to apply and just overall an amazing full-coverage concealer that is lightweight! Ultra HD Foundation// This is the holy grail of foundation. It's so lightweight and easy to blend but has a great full coverage look. It's creamy and I just use my hands to rub it on my face- almost like a moisturizer. It's pretty matte but also feels very hydrating and glowy. Sukari Baby Facial// I've seen so many rave reviews on this product. I am such a skincare junkie so I'm always dying to try the newest, best products. This product is a AHA/BHA mask... there is a whopping 25% AHA in the product! For those that don't know, AHA is alpha hydroxy acid and BHA is beta hydroxy acid. Both acids help to slough away dead skin and exfoliate, leaving a brighter complexion. Summer Fridays Mask// Very interested to try this hydrating mask because it is getting rave reviews. SPF 30 Lip Balm// I always wear sunscreen on my lips-, especially during the summer months. My lips get so dry and this product is water resistant. http://bit.ly/2JWqVsTThis set is a good deal because for $10 more, you get 2 Fresh Sugar lip balms! High Potency Night-a-Mins// I had a sample of this that I used when I was traveling but ran out. It's SO thick and creamy. I love slathering it on at night and I wake up with my skin totally hydrated. It's such a nice cream, I could not recommend it more. Drunk Elephant Skincare Set// I love Drunk Elephant products and I'm always needing travel size products because I don't typically travel with full-size products. These will be perfect and I'm excited to try new ones! Lip Mask// I've seen this on Instagram a lot lately and I'm wondering if it works better than just typical lip balm. Hydrating Gift Set// I love when Sephora does gift sets with all different brands. This one has so many products I'd love to try all in one package! It's such a good deal even without the discount! Last week, I went to a new-to-me salon in Pittsburgh, Studio Booth. 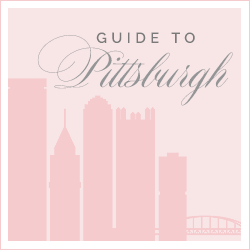 It is located in the Shadyside/East Liberty neighborhood (right next to Trader Joe's. For my partnership with Wella, I headed to the salon because they offer Wella Color and WELLAPLEX (which is their newest launch this month)! I was excited to try out Wella Professionals color because I had heard so many amazing things. 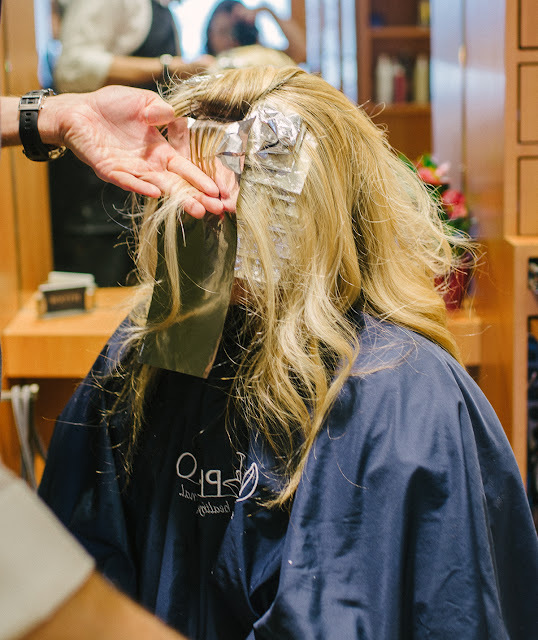 I met with my stylist, Jay, who told me he would be using the Professionals BLONDOR FREELIGHTS lightener on me, WELLAPLEX, and a gold toner. He also trimmed my hair! Jay was so fabulous in recommending what he thought would be best for me while also keeping in mind what I preferred and like for my hair! I wanted to share some before photos with you so you are able to see the difference. My hair was on day 5 of not being washed or styled. So this is basically what it looks like just before I wash it. I basically woke up, brushed my hair and went to the appointment. Overall, my hair is decently healthy (Jay said it was definitely healthy so I was happy to hear that!). I take care of it! However, between highlights and heat/styling tools, my hair takes a beating. I have some breakage and my hair definitely errs on the dry side. You can also see my roots majorly needed a touch-up! I had gone about 6ish weeks without highlights (I typically get them done every 4-6 weeks). 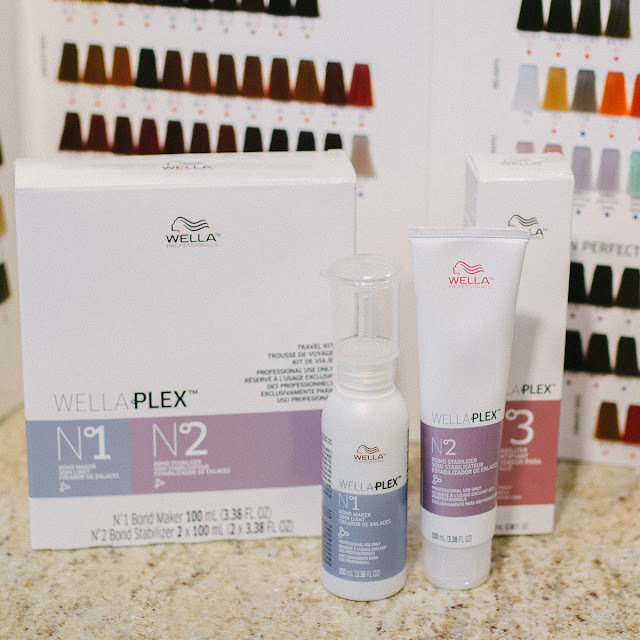 WELLAPLEX is Wella's newest product that just launched this month! If you haven't heard of it, you are going to be SO glad you did because it's life-changing and I promise you that is no exaggeration! 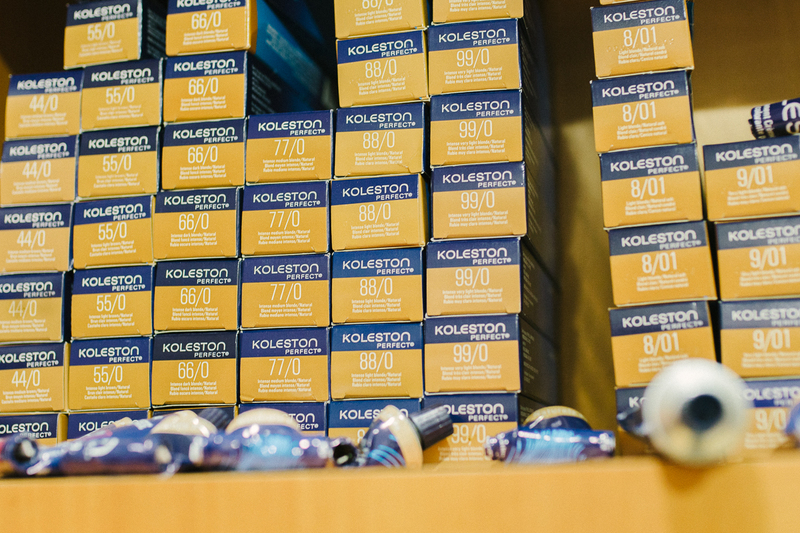 It's pretty scientific, but basically, it reconstructs your hair to make it stronger and make the color able to bond to the hair better, which in turn, makes the color look better. It quite literally repairs your hair and the end result is a beautiful color, healthy shine, and just an overall improved look. There are three steps to WELLAPLEX. 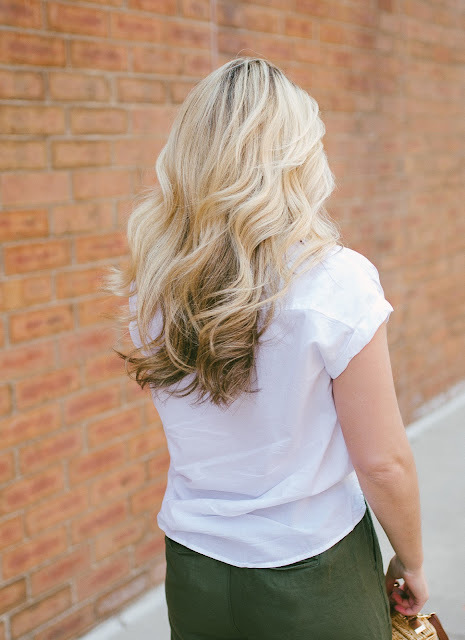 The first two steps are done in the salon and the third you do once a week at home (kind of like a hair mask in that it really makes your hair feel hydrated and healthy!). The first step is the WELLAPLEX No. 1 Bond Maker and the second step is the WELLAPLEX No. 2 Stabilizer. 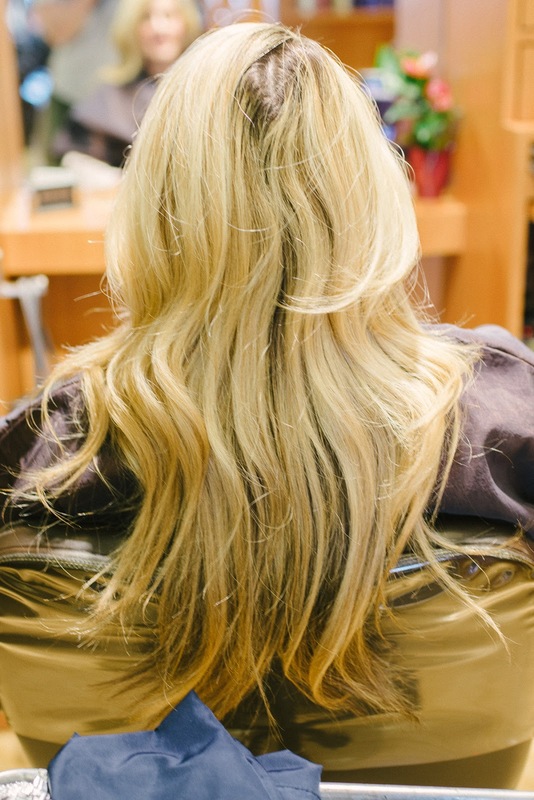 Your stylist just mixes these steps into your color so it doesn't really add any extra steps or time to your typical salon process. Once you leave the salon, besides using the WELLAPLEX No. 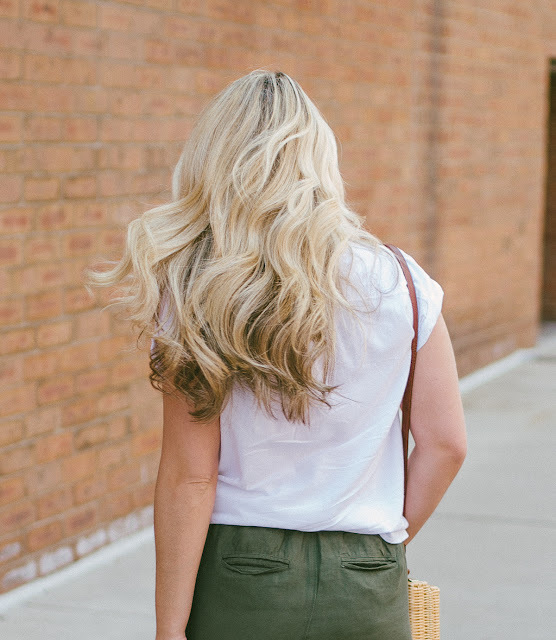 3 Bond Stabilizer (the take-home step), you can use Wella's FUSIONPLEX line which consists of an Intense Repair Shampoo, Conditioner, and Mask. 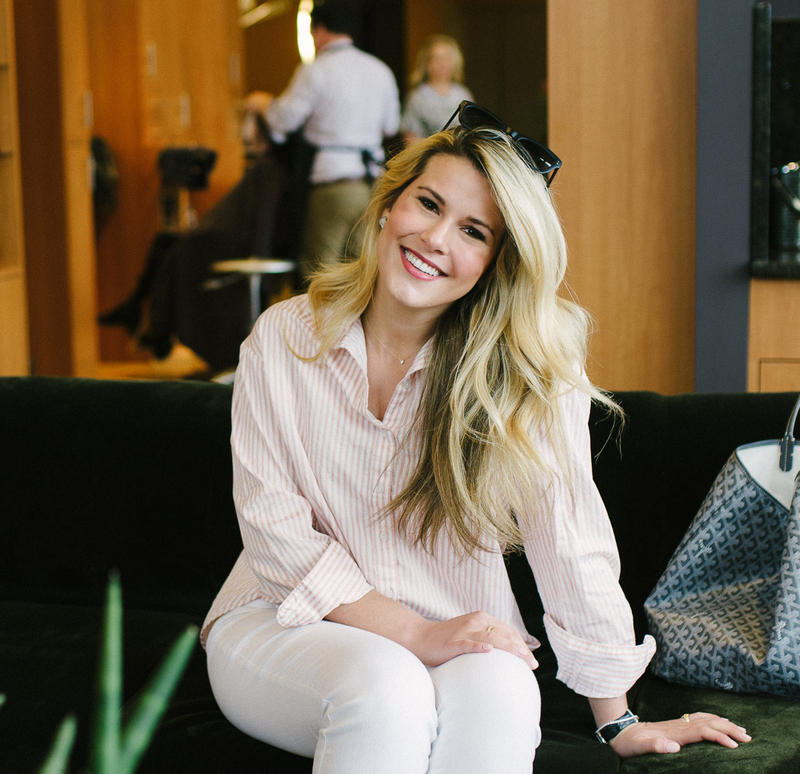 The FUSIONPLEX line is designed to continuously repair your hair and prevent breakage out of the salon and even prevent damage from the sun and from heat tools. You can use the products as you normally would any other shampoo/conditioner/mask. These products not only smell lovely (light and fresh) but they also really do work. I'm very picky about shampoo/conditioner and this one leaves my hair well-conditioned! I also love the mask. I'm such a hair mask person, but this might be the best one I have ever tried because it's SO thick! I really think the photos speak for themselves! Overall, my hair feels SO good. I had others feel it (to make sure it wasn't a placebo effect) and everyone confirmed that it is most definitely softer and smoother. It looks so much healthier and the blonde is very 3 dimensional and rich. I think the first step is finding a good salon and stylist in your area, but it's also important to pay attention to the products they use on your hair. These are chemicals and not all are created equally! 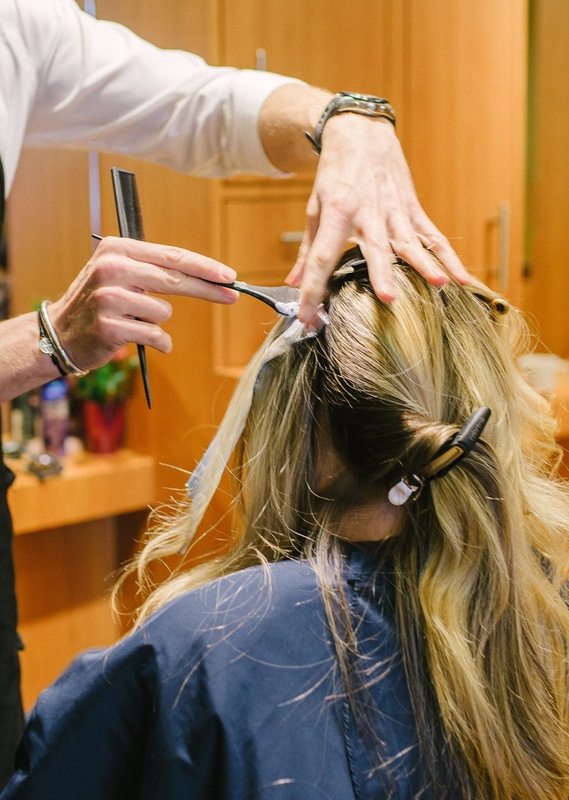 Check to see if you have a Wella salon in your area! I cannot say enough good things about Wella Professionals color and WELLAPLEX and I wholeheartedly recommend it. I also had a wonderful experience at Studio Booth with Jay! A big thank you to Wella for sponsoring this post. All opinions are my own. This past weekend was absolutely jam-packed and so much fun and this weekend has been pretty good besides the SNOW! Can you believe it? I honestly couldn't, especially after we had an 80+ degree day this past Saturday! This week I got a lot done and had my first violin lesson! I'm currently trying to take it easy because I hit my head so hard on my refrigerator (how I did this, I have no idea). But I have a giant lump and bruise on my head and I definitely gave myself a concussion. Nothing major but I've had ome bad headaches here and there. This weekend is going to be low-key. I am ready for some r and r! Wearing: On Thursday, some girlfriends took me out to celebrate. We headed to the Fairmont's Floor 2 restaurant. It's pretty new and I had only been once before for a cheese plate and drinks. The decor is soooo good. It's straight out of the Mad Men era and really nails the Mid Century Modern vibe, making it chic and trendy. Which, was perfect for the dress I wore. It's definitely something Betty Draper would have sported. This dress is gorgeous and I honestly can't believe how low the price is for the quality and craftsmanship. It has a cute mock neck with a bow, a conservative pleated skirt-length and it's nipped in the waist. Eating: I made a burrito bowl with leftover turkey taco meat and used spaghetti squash instead of rice. It sounds really weird but it was actually delicious. I think I'll plan on doing it this way from now on! Drinking: I've been obsessed with Tangerine La Croix lately. It's SO good and tastes so fresh! Sale-ing: For the Sephora Rouge Members, you already know that Sephora is having a 15% off sale. However, the sale is open to VIB members starting tomorrow. You can see my favorites in the widget above and I'll have a full blog post highlighting the sale on Saturday. The sale ends 4/23. Watching: You guys absolutely need to watch American Crime Story season 2 (it's on FX). It's about the Versace murder and it's SO creepy. I watched all of the episodes in 3 days. I was addicted. The story is crazy and it's really well done. 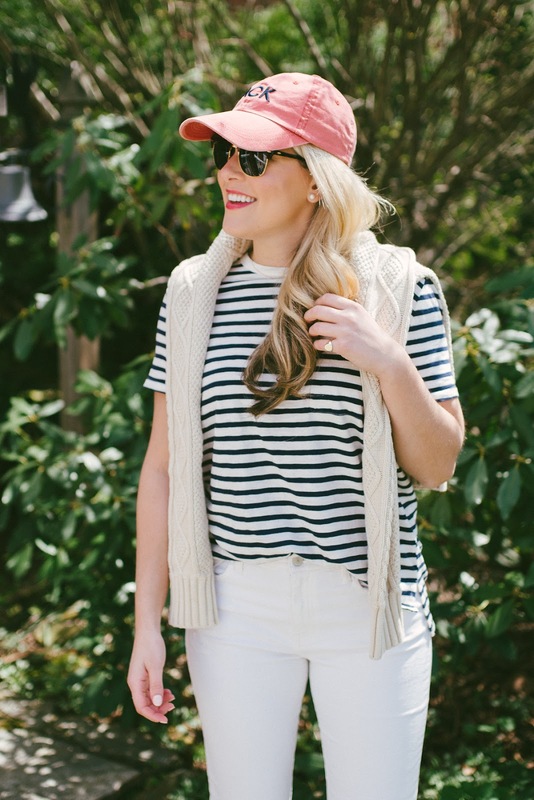 Loving: Barrington Gifts has some new arrivals featuring their spring prints and colors and I am obsessed! The yacht tote is one of my favorites because of the roomy size, luxe leather, and 6 pockets. With graduation season upon us, I think Barrington Gifts is a really great resource for personalized gifting! My picks for graduates are this weekender, this wallet keyring, this laptop cover, and this classic tote. 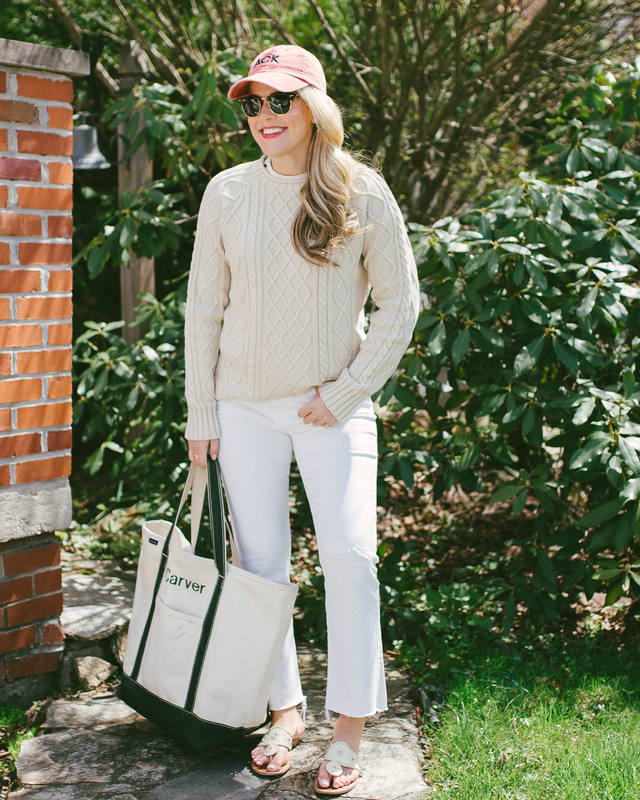 Loving II: I'm in love with this men's fisherman sweater. I ordered a size small for myself, so fingers crossed that it fits! I will report back because it's such a classic spring/summer/fall staple. Wanting: I've been looking for a really functional jacket to wear in the rain. I have some cuter rain jackets but they either don't have a hood or don't truly repel the water. I came across this jacket and I think it might be perfect! I have to take Henry out multiple times of day regardless of the weather so a good rain jacket is a must in my book! Pittsburgh-ing: Two weekends ago I headed to Eddie V's with my parents. It's located in the Union Trust building which has just gone through a major renovation. It was my first time actually walking through the building and it really is incredible. Not a huge fan of the blue carpet and the purple chairs, but it all somehow works. But looking up is the best part! Definitely one of the most beautiful buildings in downtown Pittsburgh. Pittsburgh-ing II: It's certainly no secret that DiAnoia's is one of my favorite places in all of Pittsburgh. I went to brunch there the other day and we ordered the Nutella Panzerotti. Oh my gosh. You need to RUN to get one. It was absolutely incredible. Such a treat. Quoting: 'Some people give time, some money, some their skills and connections, some literally give their life's blood. But everyone has something to give.' - Barbara Bush // See more of my favorites, here.